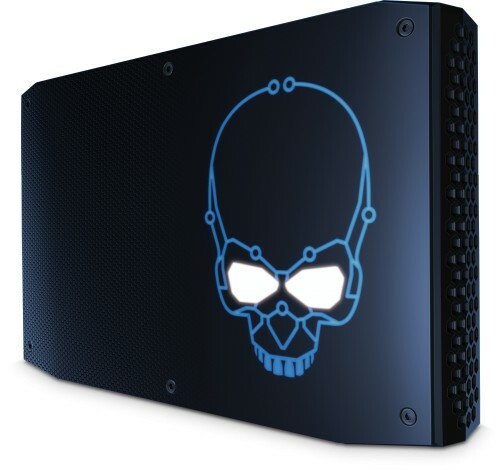 This "i7" version of the UltraNUC is a fully built Ultra-Compact PC based on the 8th Generation Intel NUC. Configured to your specification with memory, SSD and Operating System, just plug in and go! The Intel® Next Unit of Computing (NUC) is a small PC kit powered by an Intel Core i7 processor. In its 8th Generation form, it provides responsive performance and energy efficiency at the same time. The UltraNUC Pro i7 is a fully-built PC based on the 8th Generation NUC in a tiny package with the main improvements over the standard UltraNUC (7th Generation NUC) include faster CPU performance, better 3D graphics, a SDXC card slot and improved built-in WiFi and Bluetooth. Even though the NUC is small in size, it is just as versatile as a full-sized computer whilst being convenient enough to be portable. The HDMI and mini-DisplayPort outputs provide full 4K resolution as well as 7.1 digital audio output (a capable AV Receiver is required). You can easily travel with the NUC and simply connect it to an LCD TV at the place you're travelling to - a remote office, hotel room or friend's house. A whole host of capabilities are possible when connected to the internet via broadband. The NUC is the epitome of versatility and portability. Alternatively, you can enjoy an uncluttered desk with the NUC mounted somewhere out of the way - even behind your monitor, with the included VESA mount! We offer the UltraNUC Pro i7 with an Intel Core i7 8809G Quad Core CPU, which runs at 3.1 GHz and turbo boosts to 4.2 GHz. Alternatively, there is the Intel Core i7 8705G Quad Core CPU version which has the same clock speed as the i7-8809G but the turbo drops from 4.2 to 4.1 GHz. There is also a difference in the performance of the Radeon Vega graphics used in each NUC. The i7 8809G features the Radeon RX Vega M GH graphics while the i7 8705G uses Radeon RX Vega M GL graphics. To give you an idea on the performance of GL version, it is equivalent to the nVidia GTX 1050Ti and the GH version is around a 40% increase in performance compared to the GL. Intel 8th Gen NUC Core i7-8705G 3.1-4.1 GHz, NUC8i7HNK ? Intel 8th Gen NUC Core i7-8809G 3.1-4.2 GHz, NUC8i7HVK ?